This is the most widely used configuration, and typically these systems have solenoids with bore diameters between 1 inch and 5 inches and homogeneities in the range of 1.0% to 0.01% over a 1 cm diameter spherical volume (DSV). Fields up to 9 Tesla are generated with NbTi solenoids and higher field solenoids > 9 Tesla generally require Nb3Sn conductor when operated at the normal boiling temperature of liquid helium (4.2K). 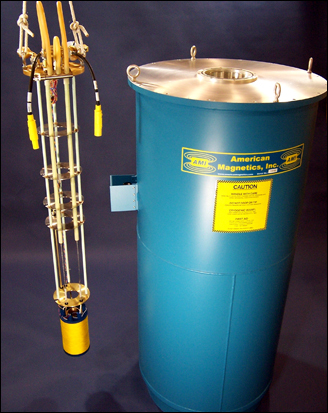 Our standard magnet systems are offered with a VTI that could be operated over 1.5K to 325K. These could also be used with 3rd party He3 or dilution fridges. Custom systems include use of magnets that are designed for minimizing stray fields (i.e., active- shielding) or have reduced field compensation stages for use with dilution fridges. 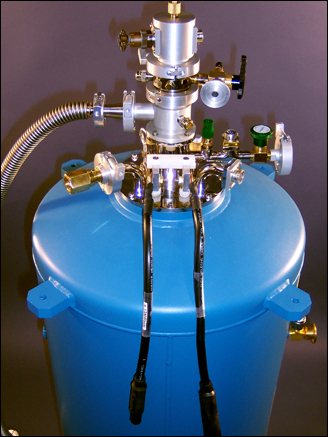 Cryogen free versions for most of the systems are also available.